I have made a new knitting/world-wide-web friend. It started last winter when the ‘Wednesday Afternoon Gang’ at Grey Heron chose to do a KAL. The KAL project they mutually agreed upon was anything that involved thrumming. Hats, mittens - they didn’t’ care as long as they learned to thrum. As their ‘teacher’ my self-imposed requirement is always - I can not lead if I do not join. So I decided to KAL with them and to knit a thrummed hat. Blogged about here. I no sooner published that particular blog post about my finished, thrummed hat when I received an email from ‘J’ in Nova Scotia. Having already had some thrumming experience with mittens, she was taken with the hat and wanted to knit one herself. “What pattern did you use?” she asked. I replied that I actually didn’t use a pattern, per se. Instead, I used my ‘Need A Hat? book to establish the number of stitches to cast on, then simply inserted thrumbs every few stitches, every few rows. A number of emails followed. Firstly, ‘J’ couldn’t find the ‘Need A Hat?’ book in her neck of the woods and emailed to ask if I could get her started. After learning of her gauge, I answered with the number of cast-on stitches that I thought would work. ‘J’ did well with the beginning of the hat, then emailed to say she was stuck on how to decrease for the hat top. I rattled off a quick decrease sequence based on multiples of eight that suited the number of stitches in her hat and thought she would be fine. Not so. Instead of reducing to a few stitches ready to thread yarn through, ‘J’ somehow had 42 stitches remaining. At this point in our email correspondence, it occurred to me that the thrummed hat might be ‘J’s first hat and I enquired if that was the case. Indeed it was her first. I backtracked and emailed more details about traditional hat decreases and was soon rewarded with this picture of ‘J’s great hat. By now, ‘J’ and I were email buddies. When her next kitting issue arose, it was natural she thought to contact me.­­­­­­­­­­ She asked if I might know someone who had a particular, baby-pattern book. ‘J’, thinking she was long done with baby knitting, had no sooner donated all her baby patterns to Value Village when she learned a great, grand baby was expected. 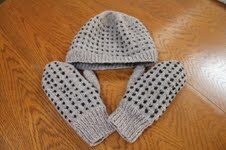 She was asked to knit for this new baby and specifically to knit the family-favourite pattern. With, I’m sure, fingers crossed she went searching for her own books at Value Village. But dang! They had been sold. As knitterly fortune would have it, I happened to have that very same baby pattern book. A friend who owned two copies had given it to me. Having never knit any of the garments from the book in the many years that I had owned it, I felt it would be put to better knitterly use in ‘J’s hands and I mailed it off to her. In exchange, I have received a lovely card with a little gift tucked inside. As well, there was an open invitation in which ‘J’ said that for as long as she owns her house, Fred and I have a place to stay whenever we might be in her corner of Nova Scotia. The world wide web of knitters. Isn’t it wonderful? Normally, I am not a ‘home dec’ kind of knitter. But last winter, friends from long ago came to visit and Mrs. K. gave me a great, hand-knit, stove towel. When I asked for the pattern, Mrs. K. frowned and said she had re-written it into her own words which was at best, she thought, a language all it’s own, and at worst, simply scribbles. Hmmm, she seemed to think this was unusual. I suggested she take a look at some of my knitting pattern notes. Assured I wouldn’t make fun of her scribbles and that I would be able to decipher their meaning, she shared her pattern. I had great fun making my first stove towel. Knit with Bernat Handicrafter Cotton and a 4.5mm needle, it was a quick knit. The pattern is a simple 12 row repeat, I am sharing here. Rows 1 – 8, Knit. Rows 9 – 12, K6, YO, K2tog to last 5 stitches, K5. Repeat the 12 row pattern a total of 6 times, then work several rows of decreases as follows. Next row, K10, K2tog across. Next row – K9, K2tog across, next row, K8, K2tog across, next row, K7, K2tog across. Repeat, working one less stitch before the K2tog each row until there are 5 or 6 stitches remaining. Knit those few stitches until tab is 4 inches long. Next row, Knit across, working a YO K2tog buttonhole in the centre of the row. Knit one more row, Cast off. Sew on a button and fasten on your stove handle. Mine, I think, I will gift to my next-door, trailer neighbour when I leave for home at summer’s end. She has been accompanying me on my daily, morning walk. This is a great comfort to me as I think bears less likely to attack if there are two of us. Perhaps I’m naive. Her husband says – two walkers make a bigger meal for the bear. It is wonderful to have a grand child who is interested in the same crafty things as Grandma. Abi, now 10, has long been interested in sewing. I had taught her to hand sew and last summer she made a delightful ‘bear’ bib for one of the new babies in the family. This year, though, Abi felt ready - not to mention eager - to move on to machine sewing. My first machine sewing project was an apron. One straight piece of fabric gathered at the waist and topped by a long, double-thickness sash. It seemed to me that an apron was not a project that would appeal to this generation. I mentioned the first project dilemma to Cathy, the very ‘tuned-in’ owner of Meaford’s fabric store, and immediately she suggested pyjama pants. Not a garment to be worn in public means rookie mistakes like crooked seams don’t matter as much, she said. Pyjama pants it was and I came north with my machine, fabric, pattern and a promise to have a couple of ‘girl days’ to teach Abi how to sew. This week James’ plans to spend time with his buddies gave us the perfect opportunity for those girl days and sewing lessons. At the end of the first afternoon, Abi had her first machine sewing project – green pyjama shorts. Day two, with straighter seams, a purple pair. This is the type of activity that Grandma enjoys. Much more so than some of Abi’s other interests. Meet my junior ‘Python’ Hunters. With camera & cord in hand and use of son & DIL’s wireless setup, today, I have pictures. And I take you back to New Liskeard and The Match Factory. Here is the smiling, cheerful Bea, owner of New Liskeard’s great yarn store - TheMatch Factory. With a smile like that, no wonder she is a super salperson. Remember I went to browse, to have one last fibre fondling fest before arriving for the summer in Hearst. Yet I came out of the store with this. A Sweaterkits kit for a delicate, colourful scarf. One skein of Silky Mulberry and one skein of Silk Whisper. The Mulberry is a lovely silk while the Whisper is a mohair/silk combo in a thread-like weight. The pattern is simple. A few rows of garter followed by one row of Yarn Overs to give it holes, knit first in the Mulberry then repeated in the Whisper. I am not sure of my colours. I had hoped that the Mulberry had more colours hidden in the centre of the skein, but no. It is simply shocking pink and orange. The Whisper has some pink and orange in it but its predominant colours come from the blue/purple family. I look at it often and question if they compliment or clash. The scarf Bea had on display was gorgeous – partly for its colours, but mostly for its feel. And since I was definitely not the first New Liskeard shopper to appreciate its luxury, the pickings were slim. I have been referring myself to my own oft-mentioned advise to ‘have faith’. In the end I think it will have its own beauty. The one thing I know for sure is that the colours are definitely not mine. Dorothy’s colours, yes. For sure. So perhaps Bea has just started me on my first Christmas knitting for 2012. Told you she was good at her job. I doubt her flame will ever fizzle. More than a week has passed and this is my first computer day. Yes there has been withdrawal. And a vacation state of mind it seems, as I arrived at the library with my camera - thought I was so smart to remember it - but no computer attachment cord. So no photos today. There are two pieces of knitting related news to tell though. First, Gemini is almost finished. I should have FO pictures by my next computer visit. Secondly, we I visited a great yarn store in New Liskeard on the drive up. Called The Match Factory and owned by a lively lady named Bea. A great salesperson she is too as I intended to visit, look, see, handle, fondle but NOT BUY. Of course she talked me into - HAH! - a decadent, Sweaterkits scarf kit and pattern. Pictures of which I will post on my next computer day. In the mean time, the story of her shop name is interesting and requires no photos. In the north, many, over the years, have headed south to set the world on fire. Only to return home when the flame fizzles. Apparently when questioned as to why they have come back north, the common answer over the years has been I ran out of matches. Hence the name Bea chose for her store - The Match Factory. If I were able to figure out this French keyboard, I would give you quotation marks and a link to Bea's store. But next time I get to the computer, I will give you photos. In the meantime, enjoy your summer everyone. My annual summer migration starts tomorrow. We are off to the trailer in Hearst for five or six weeks. When your son re-locates for work, to a town 12 hours away, then marries and has your only grand children in a town 12 hours away, a trailer for summer living within 15 minutes of the grand children is a must. We spend several weeks there every summer. which gives us a sense of what it must be like to live near one's grand kids. They pop out for an after-dinner swim. They have sleep-overs. They come with Mom & Dad on the weekends for bar b ques, swimmming, fishing and all those other lakeside activities common in a Canadian, northern summer. But there is lots of things left behind to miss while I am gone. Daily blogging is one of them. With no internet connection out at the lake, my posting is restricted to visits to town. Regular posting - and life - resumes mid-August. In the mean time, here are some of the other things left behind when we get in the car tomorrow morning at 6 am. Canada Day turned out to be too hot for anything but a red tee. But fortunately, Saturday morning, with a bit of freshness to the air and some errands to run, meant I could try out the Cotton Tweed, 'holey', summer sweater that I completed in - may I remind you? - 12 days. As always, the proof is in the wearing and my 12 Day Sweater didn't disappoint: Not too heavy, not too warm, stays on the shoulders just right, fits well and can be worn with any colour. A winner, I'd say. Time will tell if the looser gauge - 20 stitches over 4 inches rather than the prescribed 22 - will wear well. In the meantime, I think it will be a 'go-to' sweater for any and all cooler summer days. With a strong statement that I am in no way part of this corporation or even support the use of it's product, I did think this cute and appropriate for today. And this version for the knitters who rock. Happy Canada Day everyone. And happy 4th to my neighbours to the south.